In the days of my youth, I was an active local DJ. I had a few nightly residencies and the opportunity to open for a few national acts. This was in the waning days of DJ’ing with vinyl — CDs were on the ascent and vinyl controllers such as Serato and other USB controllers were just emerging and incredibly expensive. These days I DJ mostly as a hobby, doing it occasionally to relive the glory days and to just have a good time. While I love DJ’ing with vinyl, the one thing I have always hated is lugging around vinyl. I can assure you no vinyl DJ loves her records while carrying them back home at 3:00 a.m. This was one of the reasons I was excited to test out the iRig Mix, especially being able to have my whole DJ rig in shoulder bag that I could carry effortlessly. Sign me up! 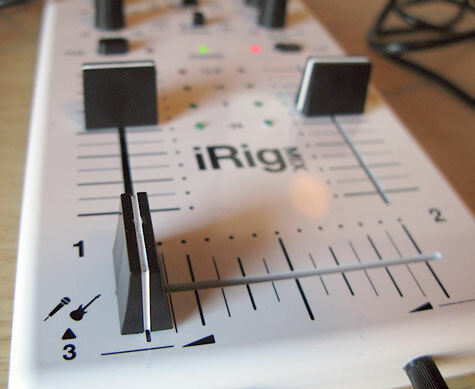 Starting with the hardware, the iRig Mix mixer is a small, compact device. If you could fold an iPad in half lengthwise, you would have the approximate dimensions of the iRig Mix. The construction is a white plastic housing with black plastic dials and sliders. The iRig is light, but it feels solid. The sliders for the crossfade and the channel volumes are a little high and thin for my tastes, but this is clearly a subjective choice. Everything is plainly labeled; if you have ever used a basic 2-channel DJ mixer, you will find the iRig Mix very familiar. I do wish that it had a three band EQ (Treble, Mid, Bass). Instead, we have only two bands (Treble, Bass). 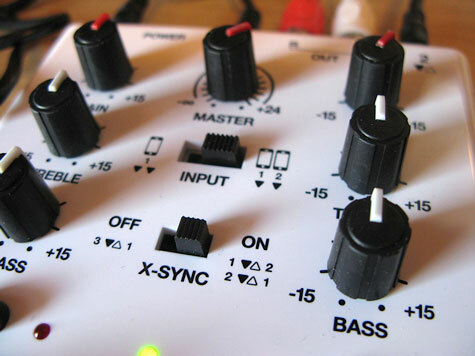 You have cue switches for the two main channels just like any DJ mixer. The one additional switch is the X-Sync switch, which I will detail in the software portion. Overall, I found the iRig Mix to be a solid piece of equipment. Its compactness and lightweight build means you can easily take this anywhere and plug in and go. I can see this being a small mobile kit for parties or events where someone like me may want to DJ but not haul a lot of equipment around. Technically your whole kit could be an iPhone and the iRig Mix! Definitely much easier than hauling 50lbs. of records. The companion software DJ Rig is loaded with tons of features and effects that any DJ would love. There is a three band EQ with solo kill switches, plus a four bank sound pad with record, edit, and pitch functions. There is also an effects processor with effects that can be added via in-app purchase (it comes with a low pass effect for you to try out). Looping can also be added as an in-app purchase as well as multi-cue saving. While many of the features are not available in the free version of the app, I found DJ Rig to be completely usable right away with no need to purchase any of the additional features. DJ Rig’s initial interface is a “vinyl” interface with two turntables, but you can switch to a CD interface, or for in-app purchase, a waveform interface. There are numerous features beyond the scope of this introductory review, but the one I will discuss is the X-SYNC feature. When using two iOS devices or an external device with an iOS device, DJ Rig will synchronize tempos with the audio playing. In my tests, this was effective about 70% of the time, which I think is decent. When it was off, it was off pretty far where it looks like it thought the next track should be either double of half the tempo of the active track. Having said that, it is great to have if you want to get extremely close to the right tempo for blending. There is one minor quibble that I have and this is a personal issue. I have looked up iOS DJ apps before and the one thing that I would love is a single turntable mode. 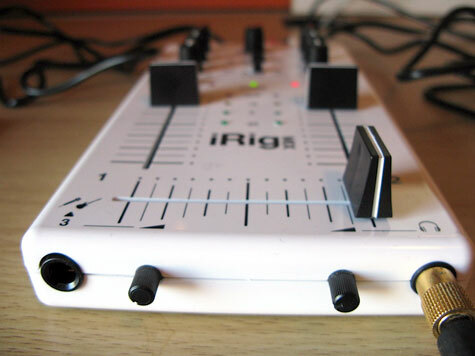 I was really hoping that DJ Rig had one; especially combined with the iRig Mix being able to re-create the two “turntable” effect would be amazing. Again, this is strictly my opinion. 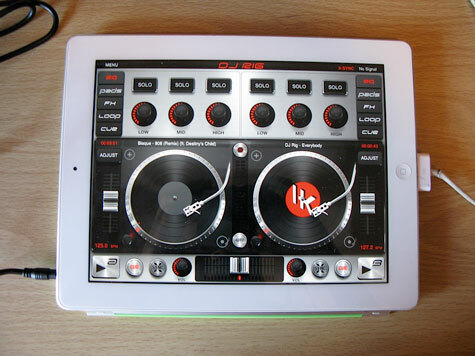 Overall, the iRig Mix and DJ Rig companion software make an effective and powerful combination for iOS DJ’ing.